The old Baker St South Rd, which ran along the western edge of the Gosford Public School site, when closed, was absorbed into Leagues Club Field, and an integrated public Crown Land recreation zone was made. 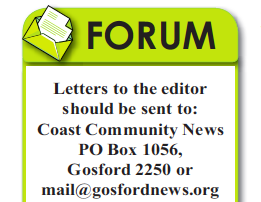 Gosford Council as Trustee (refer council minutes) resolved it should become part of Leagues Club Field Crown Land, preserved as open space for public recreation, and it was set aside as open space. Just because it used to be a road is no reason to reopen it to traffi c. It is being done by Mike Baird, with the support of Adam Crouch, not to facilitate a public purpose such as the promised cultural -precinct of Our City Our Destiny Master Plan, as promised, but to sell to private developers for privately owned tax and fi nance buildings (leased by government for 10 years) on the site reserved for an Arts and Cultural precinct. Furthermore, the Baird Government intends to allow Doma to meet its Tax Offi ce parking requirements by building them a public road. Where else do developers get a chance to purloin part of an alleged public road as development required public parking? Much used and needed public open space, as part of Leagues Club Park, is being stolen by Mike Baird to sell off to the private sector. Moreover, the biannual circus revenue raiser for Council will no longer be available, creating a further drain on ratepayer funds to maintain Leagues Club fi eld. The Crown Lands Offi ce advises this land is leased to Gosford Leagues Club until 2023. Did the Council as Park Trustees allow this development, and if so by what process?